Inevitably in life you will find yourself facing people who are more aggressive than you are–crafty, ruthless people who are determined to get what they want. Fighting them head-on is generally foolish; fighting is what they are good at, and they are unscrupulous to boot. You will probably lose. Trying to fend them off by giving them part of what they are after, or otherwise pleasing or appeasing them, is a recipe for disaster: you are only showing your weakness, inviting more threats and attacks. But giving in completely, surrendering without a fight, hands them the easy victory they crave and makes you resentful and bitter. It can also become a bad habit, the path of least resistance in dealing with difficult situations. This is what makes the German invasion of the Rhineland in 1936, and the allied reaction to it, all the more puzzling. In that episode, it was the Germans who were weak, and the strong allies who let themselves be intimidated. As a result, Hitler rightly got the impression that he could violate the Treaty of Versailles with impunity, and he began a rearmament and territorial acquisition program that gave him a great head start in World War II. Few people seemed to note this at the time, Winston Churchill being among the only prominent personalities who saw what would come. As I’ve said here before, World War I changed everything. It was truly an apocalypse. It completely destroyed the old world and forced a new one onto the rubble. Among the things destroyed was the old attitude toward war. Thoughts of glory were long gone. No longer could blind love for king or country be used as a recruitment tool. Public displays of celebration at the outbreak of war were a thing of the past. At the same time that the horrors of war grew so ghastly with the advent of industrial technology, more people saw them than ever before through improved photographs, motion pictures, and the radio. They knew what World War I had been like and no one wanted to repeat that experience. It was an understandable instinct. Unfortunately, it was also one Hitler was counting on. His invasion of the Rhineland (or more accurately, his decision to remilitarize it) was predicated precisely on a gamble that Britain and France would be too timid to stand up to him, for fear of starting another war. Yet, by giving into this fear, Britain and France made a war more likely. 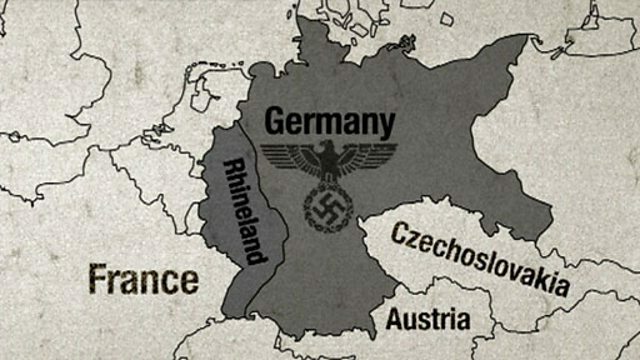 The Treaty of Versailles mandated that a 50 kilometer stretch across the Rhineland be demilitarized. This took the western portion of the highly industrialized Ruhr region, famous for its steel and coal and which served as the primary area of munitions manufacturing during World War I, out of full German control. More importantly, the region was the waypoint between France and Germany. By keeping it demilitarized and subject to allied occupation, the terms of the Treaty of Versailles could be more easily enforced, and Germany would have a much more difficult time mounting a westward offensive. It would also serve as a major avenue for offensive operations into the interior of Germany should that country ever take an aggressive stance again. France would demonstrate how powerful this provision was in the 1920s, when, according to the terms of the Treaty of Versailles, it occupied the industrialized Ruhr valley (not the entire Rhineland) for lack of German reparations payments. Notably, among the French occupation forces were African colonial troops, making the German humiliation that much worse, and giving Hitler and the Nazi Party, then still an insignificant force, numerous tools for propaganda. Over ten years later, it was clear to Hitler that this situation was intolerable, and virtually all of Germany agreed with him. This popular support would be key to his rise and consolidation of power, which the Rhineland invasion helped him to do. His soaring popularity as a result of the action he took would only help him to justify his other territorial annexations leading up to World War II. The Rhineland provision of the Treaty of Versailles (and the whole treaty itself, for that matter) made sense from a military standpoint but it was a psychological disaster. By humiliating Germany and the German people and bleeding them dry economically, the allies left little options but for a strongman to rise to power who would be prone to taking the country into a second war. The Treaty of Versailles failed in the dimension of persuasion. Now would come the failure in the physical world. The German army in 1936 was far from the mighty Wermacht that would cut huge swathes through Europe from 1939 to 1941. The army that Hitler sent into the Rhineland was tiny at only 30,000 men. A counterattack from France could have easily destroyed it and gone on to remove Hitler from power for violating the Versailles Treaty. Instead, Hitler’s idea that the western powers were spineless and wouldn’t dare fight another war with Germany seemed to be proven correct. He well knew how big of a gamble he was taking and how easily it could tank, but his insight into the psychology of his opponents was at that time correct. It would only encourage him to take more land in years to come. They didn’t understand the psychology of Adolf Hitler and that this was a man that couldn’t be reasoned or negotiated with. Von Neurath said that it was the policy of the German government to do nothing active in foreign affairs until “the Rhineland had been digested”. He explained that he meant that until the German fortifications had been constructed on the French and Belgian borders, the German government would do everything possible to prevent rather than encourage an outbreak by Nazis in Austria and would pursue a quiet line with regard to Czechoslovakia. “As soon as our fortifications are constructed and the countries of Central Europe realize that France cannot enter German territory at will, all those countries will begin to feel very differently about their foreign policies and a new constellation will develop. In short, Hitler was allowed to take this strategic area, consolidate his power, and move on to even grander ambitions, safely secure in the knowledge that his potential enemies were too scared to fight him. He could now safely regard the Treaty of Versailles as a “scrap of paper.” The result would be an even more destructive war than the one that haunted the western powers in the first place. Failure to understand your opponent’s psychology, and to manipulate your appearance in accordance to it, can lead to a catastrophic fate. Start building this crucial skill by reading Stumped now.